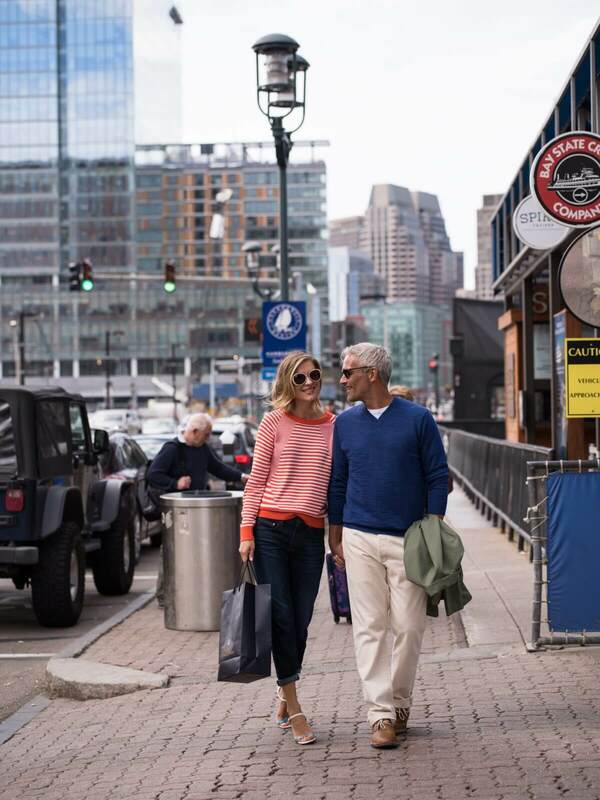 It’s no surprise why Boston Magazine dubbed the Seaport a wellness capital. Love working out year-round? Watch out for Equinox’s Seaport opening, or check out SoulCycle, just a short walk across Seaport Boulevard from PIER 4.
lululemon recently announced its coming to the Seaport. You won’t have to walk far from PIER 4 to hit the gym in style. L.L Bean chose the Seaport as the location for its first full store in an urban setting, which will open next spring. Not only can you shop for a pair of “Bean Boots,” but the location will offer outdoor classes for customers, including kayaking and paddle boarding along the South Boston Waterfront. Seattle, Washington-based Filson is also opening a Seaport location, bringing more top-notch outdoor apparel to the neighborhood. Glasses are the perfect sophisticated fashion accessory, and come this summer, Warby Parker will be open at its Seaport location. Stop by and experiment with classic and fun styles that are sure to spice up your specs collection. Mr. Sid from Newton, MA is expanding, bringing the finest luxury brands in men’s suits, shoes, casual wear and accessories, to the Seaport. Don’t miss its very own barbershop next door, Seaport Barber. Need something a little more casual? This fall, Bonobos, which is known for flattering men’s pants for every day of the week, will open along Seaport Boulevard. Enjoy prime dining along the Harbor Walk at Lola 42, one of our favorite sushi restaurants in the city. Grab a table outside while the weather lasts and experience how el fresco dining should be. Seaport and Fort Point have nearly every cuisine imaginable, from raw bar to ceviche, from Mediterranean to Italian. Check out Row 34, La Casa De Pedro, Committee, Menton and Sportello (just to name a few). Looking for a lively, evening setting? Enjoy seafood towers, sushi, and steaks while listening to live music at Mastro’s Ocean Club. The owners of Shrine at Foxwoods are opening Scorpion Bar this fall. Strega Waterfront and Empire have been in the Seaport for a few years, and are great venues for cocktails with friends in a lively atmosphere. The Seaport has an abundance of healthy fast-casual options too. By Chloe has cult followings in NYC and LA, and has landed in Seaport as part of its national expansion with burgers, clam chowder and lobster rolls –that’s right, minus the meat. Think vegan food is boring? Think again. They also offer many gluten-free options. JuicePress, BonMe, Starbucks, and more are all walking distance from PIER 4 as well. The DC-based luxury beauty retailer Blue Mercury is right around the corner from PIER 4. The new storefront carries all its traditional cosmetics, but what we’re most excited about is the spa services: peels, waxes, and a world-renowned oxygen facial. Between MiniLuxe, the services at the Seaport Hotel, and this, a perfect spa day is just steps away from your front door at PIER 4. Stay tuned for more exciting retail updates from us at PIER 4.